If getting your home in order always seems to be at the top of your to-do list, you may have already heard of this book: The Life-Changing Magic of Tidying Up by Marie Kondo. I just started reading this book over the weekend (thanks for loaning it to me, Mom) but I can already tell it's going to be a game-changer. I was reading it last night just before bed and I actually went to sleep excited about getting up and getting to work this morning! My house is not a total disaster, but we have some piles (but no paper piles). 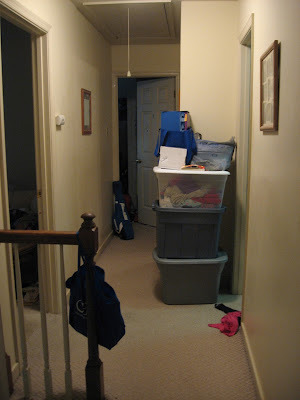 It seems like there's always stuff that needs to go up into the attic, always places that need a serious decluttering, and never a great deal of motivation to do any of it. My living room this morning. Perfectly livable, but more cluttered than I'd like. Today before I begin my "Tidying Festival" I just want to share two "aha" moments I've had so far reading this book. First, Kondo talks about those times when we go on little cleaning binges, and she gives the example of when we are trying to study for tests. I remember as a student that I would feel a need to arrange and organize before I sat down to study. I always just assumed it was a procrastination technique- and a good one, because cleaning and organizing is productive, right? I can't very well watch TV when I'm supposed to be studying- that's just wrong, but cleaning? That's useful! Well, she acknowledges that but also clarifies that we feel that urge to clean because our minds crave order in order to concentrate- this is something I know to be true. As I was reading this, however, I thought about the other time I clean a lot: when I'm angry. It's kind of a running joke in our house that if my husband wants a clean house all he has to do is really tick me off and I'm on a cleaning rampage. I always just assumed that was because it was a way for me to work off the physical energy that comes with anger (and it's more productive than bashing holes in walls or running away from home) but the more I thought about it, the more I realized that what I'm really doing when I'm on those cleaning rampages is trying to grasp a sense of control. Usually my dominant feeling when I'm in that state is one of vulnerability and defensiveness. When I clean, I am exerting control over my environment, and it starts to "bring me down" a little bit. Certainly, the physical exertion helps as well, but the reason I'm drawn to cleaning is because I feel like I'm getting my power back. 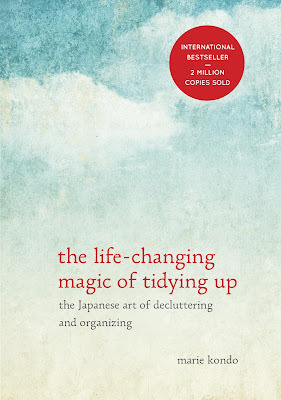 Okay, the second thing: Kondo says that before you begin the tidying (decluttering) process, you need to pinpoint the reason why you feel the need to declutter your space. Imagine your space in its ideal, tidy, uncluttered condition: what kind of life will you be living in that space? As you answer this question, she encourages you to be like a 3-year-old and keep asking yourself, "But WHY?" Why do you want to live in an uncluttered, tidy space? Because when there's stuff everywhere I always feel like I have something to do that I'm not doing, and I hate that feeling. But why do you hate that feeling? Because when there's always something else to do, I can't really focus fully on what's most important to me, like my family and my talents. But why do you want to focus on your family and your talents? Because they are the whole reason I'm here! God put me on earth to be a wife to my husband and a mother to my kids and a writer. With the clutter, I feel like I can't fully commit to my purpose in life. And that's when it hit me. STUFF is keeping me from fulfilling my life's purpose? Stupid, useless, inanimate clutter all over the place is keeping me from my kids? Is keeping me from being the mom God intends me to be? From being the wife my husband deserves? From being the author of a published novel, which has been my dream since I first read a book? And I came to this conclusion: Stuff is stupid. I know, I know- Kondo may not consider that the most zen approach (she encourages you to thank your belongings for a job well done before you donate or discard them) but it's true. Stuff is just really, really stupid. So anyway, today I'm on my way to a tidier life. I have a feeling that the process this time around will be easier than it has in the past. So, how do you feel about your stuff?